I am a sucker for just about anything strawberry. We have reached that time of year where I start to crave all things Spring. Knowing it it just around the corner makes me anxious for its arrival. 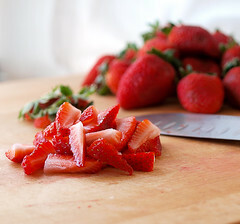 The weather here in Dallas is already starting to get warmer, and when things like strawberries start to become more affordable at the market, even though they are not truly in season, I find I can’t resist. I need a little spring to carry me through these last few weeks of winter. 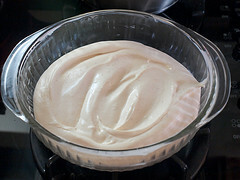 I began by creating a fluffy, rich white chocolate mousse made with some good quality white chocolate. Please, do not skimp here. Just like you would not cook with wine you would not drink, please do not bake with chocolate you would not eat. 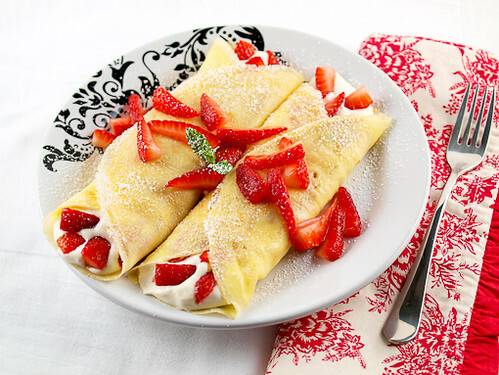 The crepes in this recipe are tender, moist, and lightly sweet. Their mild flavor does not compete with the mousse, it enhances it. 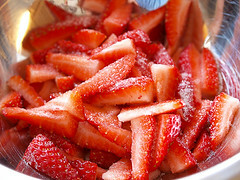 The strawberries were not terribly sweet, they never are in February, so I coated them in sugar and a hint of vanilla which made them much, much better. 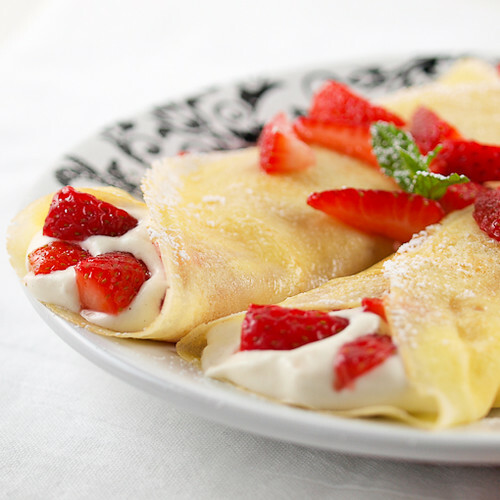 Fresh strawberries and white chocolate mousse nestled inside some buttery crepes … what could be better?. Begin by preparing the mousse. 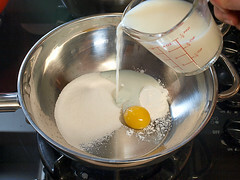 In a medium sauce pan combine the milk, cornstarch, sugar, and egg yolk. Whisk until well mixed. 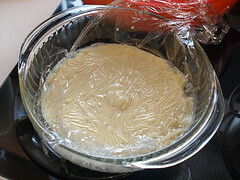 Cook over medium heat, whisking constantly until it thickens and comes to a simmer, about ten minutes. Turn off the heat and add the vanilla, butter, and white chocolate. 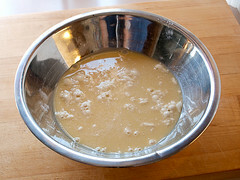 Stir until completely melted then pour the mixture through a strainer into a separate bowl. Cover with plastic and chill for at least four hours, or overnight. In a small bowl combine the gelatin with the water. Let stand for ten minutes to bloom. Once bloomed melt in the microwave for ten seconds. Let cool to room temperature. In a medium bowl combine the cream, powdered sugar, and vanilla. Beat until it thickens. 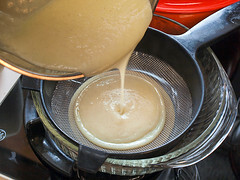 Gradually pour in the gelatin while still whisking. Beat until it forms medium peaks. 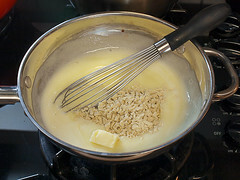 Fold the whipped cream into the white chocolate base in three additions. Cover and chill for one hour. While the mousse chills prepare the crepes. 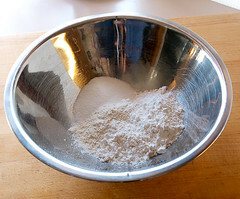 In a medium bowl combine the cake flour, all-purpose flour, and the sugar until evenly mixed. Set aside. 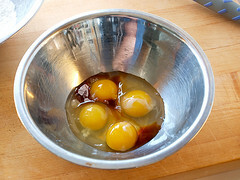 In a small bowl whisk together the eggs, egg yolks, butter, and vanilla. 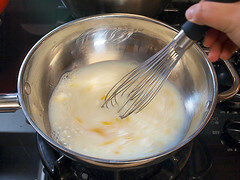 Add the milk and whisk to mix. 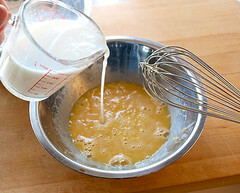 Pour the wet ingredients into the dry and whisk until smooth. Cover and chill for thirty minutes. 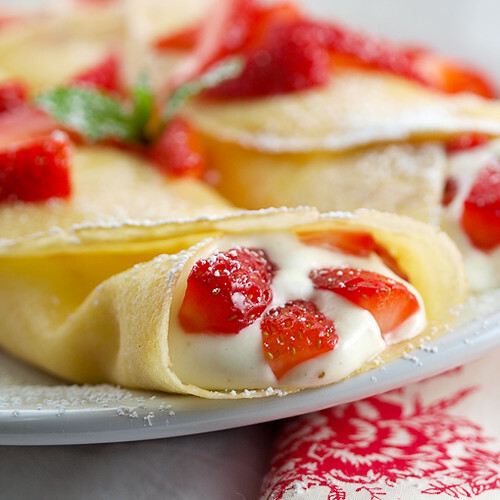 While the batter chills combine the strawberries with the sugar and vanilla. Toss to coat, cover with plastic and chill until ready to use. 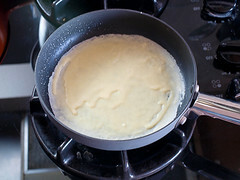 Once the batter has chilled heat an 8-inch crepe pan, or small non-stick skillet, over medium heat. Spray with non-stick cooking spray and pour about 1/4 to 1/3 cup of the batter into the center of the pan. 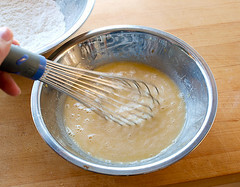 Immediately swirl the pan to evenly distribute the batter in the pan. 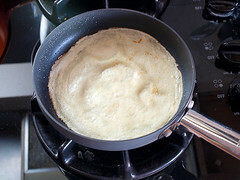 Cook until the crepe is just turning golden brown on the bottom, about 1 to 2 minutes, then flip the crepe and cook for 30 seconds to one minute more, or until the crepe is lightly golden and cooked through. 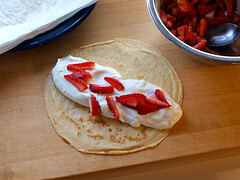 Transfer to a plate and layer the cooked crepes between sheets of parchment paper. Cool to room temperature. 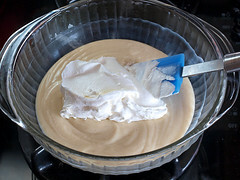 To assemble spread about 1/2 cup of the mousse into the center of the crepe. Top with the strawberries. 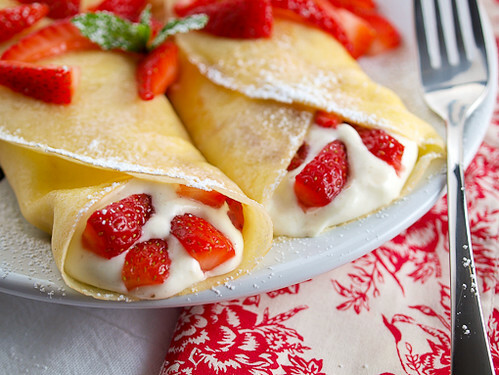 Roll the crepes into a tube and then dust with powdered sugar.